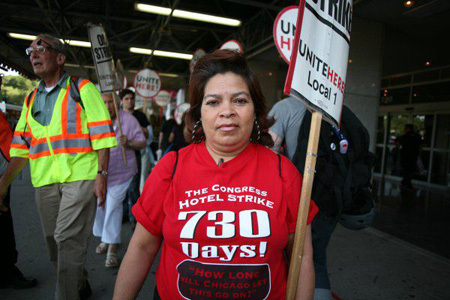 CHICAGO – With the 10th anniversary of the Congress Hotel strike approaching, Unite Here Local 1, the union representing Chicago’s hospitality workers, announced the end of strike on May 29. 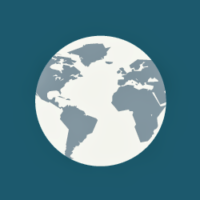 It is widely recognized as the world’s longest strike and has received broad solidarity from the labor movement and community. On June 15, 2003, Father’s Day that year, 130 members (100 percent of the workers) of Unite Here walked out on strike after the hotel unilaterally reduced their wages, froze their health care contributions, and demanded the right to subcontract out all the work to minimum wage subcontracted workers. The move by Congress hotel owners broke with the collective bargaining wage and benefit standards established for all the major downtown hotels between the union and hospitality industry. It was widely seen as a preemptive strike to break the union and force down wages and benefits. The Congress Hotel picketline became a permanent feature on Michigan Avenue. Unions and community organizations rallied with strikers, and marches often passed in solidarity. Each strike anniversary thousands would picket and often ring the entire hotel. It became a day that brought out the entire labor and progressive movement. Prominent political leaders including U.S. Senator Barack Obama, Governor Pat Quinn, President of Cook County Board Toni Preckwinckle, and numerous others have walked the line in support of the workers. The strike brought together the growing fight for worker’s rights with immigrant rights. An overwhelming majority of Congress strikers were immigrants and stood up courageously during the height of demonization of immigrant communities. The strike became a home for workers and their families. Many children literally grew up on the picket line. The Congress Hotel strikers showed how low-wage workers could lead the fight to raise the standards for hospitality workers and other low-wage workers. When the Congress workers struck the standard wage for room attendants was $8.83 per hour. The city wide standard for room attendants is now $16.40 an hour. Congress hotel room attendants still make $8.83 per hour. Unite Here organized a boycott of the Congress Hotel which cost the hotel millions of dollars in business and gained it a horrible reputation. Conditions at the hotel deteriorated dramatically. While the Congress Hotel workers were on strike, Unite Here was also battling the attack on wages and benefits by other major hotels. The fight against the Hyatt Hotel chain and its attempts to break the union has become a major global battle. “The decision to end the Congress strike was a hard one, but it is the right time for the union and the strikers to move on. The boycott has effectively dramatically reduced the hotel’s business. The hotel treats their workers and customers equally poor and the community knows it. There is no more to do there. The reclusive owner lives in Geneva and Tel Aviv and hasn’t been to Chicago since the strike started. We don’t see getting a contract here, and we have many more battles to fight for economic justice,” said Unite Here Local 1 President Henry Tamarin. The union has found jobs for over 60 strikers over the years and is looking for more. It has made an unconditional offer to return to work on behalf of the strikers, but it is unclear whether any strikers will choose to.